Don’t let the colder temperatures of winter keep you indoors. This time of year is one of the best to get outside and indulge in all of the winter sports and activities that make the season so special. Whether you’re into skiing, snowboarding, ice climbing, cross-country skiing, or snowshoeing, these three destinations are some of the best for enjoying your favorite winter sports. 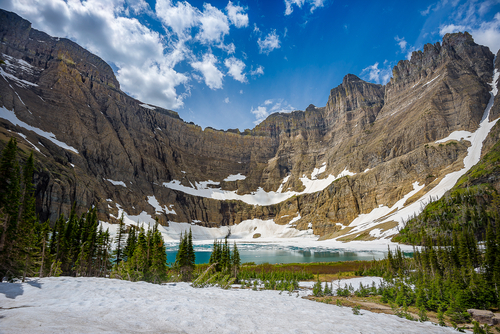 Glacier National Park is one of the best places in the country for outdoor lovers no matter the time of year. However, in the winter months, you can enjoy some of the world’s most scenic snowshoeing and cross-country skiing trails. Snowshoeing is an ideal, low-impact outdoor activity for all ages, and Glacier National Park offers trails ranging from short-distance jaunts to 40-mile-long adventures. When you’re looking for the ultimate holiday getaway, Aspen is the place to be. Aspen offers ski and snowboard enthusiasts four world-class ski resorts that appeal to everyone from toddlers on the Bunny Hill to extreme double-black-diamond skiers. The town also offers plenty of shops, award-winning restaurants and a happening nightlife scene for those who are up for a little apres-ski fun. The western United States is loaded with places that are perfect for camping and spending time outside in the colder months. Mammoth Lakes, Calif., is one of those places. Home to the esteemed Mammoth Mountain ski resort, some of the country’s most scenic cross-country skiing trails, snowmobile excursions in the Inyo National Forest and simple fun like tubing and sledding, Mammoth Lakes is ideal for a romantic winter getaway or family vacation. There’s no better way to travel throughout the country in the winter months than in the comfort of your very own RV from Fretz RV. Spend hours outside enjoying your favorite winter activities then retreat to the warmth of your luxurious home away from home.